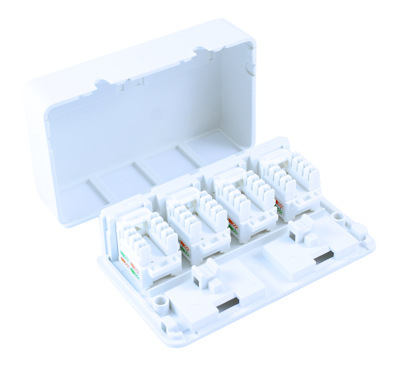 This Pre-Configured Unshielded Cat5E 4-Port Surface-Mount Box features four RJ45 female connectors as a fast, easy and cost-effective tool for expanding your Cat6 audio/video, voice or Ethernet network. 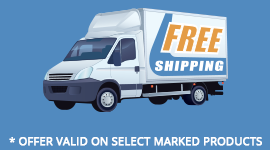 The housing mounts practically anywhere, including a wall or baseboard, using the included mounting screws or double-sided adhesive tape. Just snap open the top cover to terminate up to four 22 - 26 AWG Cat6 copper cables using a standard 110 IDC punchdown tool. The termination blocks are color-coded for easy T568B wiring. Zip ties are included for neatly securing the cables to the Cat6 surface-mount box, which features rear routing slots to allow the box to be installed flush against a wall or ceiling. Snap the cover back on, and connect up to four Cat5e cables to the pre-installed RJ45 keystone jacks with 50-micron gold-plated contacts for maximum conductivity and minimum data loss. This product offers great flexibility in placement, especially in applications where in-wall box and wire installation is impossible. 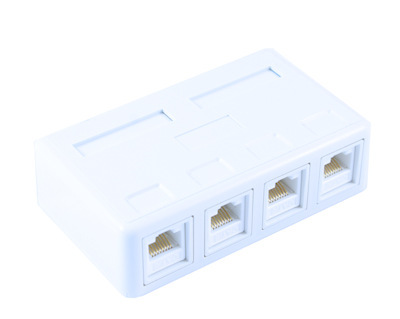 RJ-45 (CAT6) surface mounting block for baseboards or walls.